Rut: a long deep track made by the repeated passage of the wheels of vehicles. I was going to call this article "In the Wheel Tracks of Len Beadell", but 2 things stopped me. Firstly, the name has already been used for a similar travel article (see references), and secondly, "ruts" more accurately describes the current conditions of his tracks. Alternatively, the words furrow, groove, corrugation, trough, ditch, hollow, pothole, wash-away or crater would not be inappropriate. This is not Len Beadell's fault of course, his job finished in the 1960's and almost no maintenance has been undertaken since then. What's actually surprising is that most of his 50 year old bush tracks are still navigable at all. But more importantly, Len Beadell's tracks provide a great outback driving experience, with some challenges and excitement thrown in, and along the way you can't help but get caught up in the history and scenic splendour of this part of Australia. A typical sample of a Len Beadell track. Click on Read More below on for some history surrounding Len Beadell and our account of travels on some of his tracks. Starting his working life as an army surveyor in SE Asia during WW11, he subsequently joined the Weapons Research Establishment in Salisbury, South Australia (now the Defence Science and Technology Organisation (DSTO)) and was instrumental in developing most of the infrastructure to support the British atomic tests carried out in the remote west of South Australia during the 1950's and 60's. The Gibson Desert from McPhersons Pillar just 30 km off the Gary Highway, built by Len Beadell in 1963. It looks deceptively green and pleasant but we are 300 km from the nearest habitation (at Warburton) and it was scarily remote. We saw no one for 5 days. As part of that 8 year program, he surveyed and selected the location for the Woomera Rocket Range, the Giles Meteorological Office, and the Emu and Maralinga atomic test sites. Integrating these facilities with existing highway and rail access meant the development of 6,000 kms of linking roads and tracks covering 2.5m square km of then undeveloped areas across South Australia, Western Australia and the Northern Territory. A mudmap of Len Beadell's tracks can be found on the Beadell Tours Home Page here and a more detailed map of Len Beadell's outback road network and a complete anthology of all his work is contained in "A Lifetime In The Bush", a biography of Len Beadell © Mark Shepard, available from Westprint. The tracks we have covered are the red and blue coloured GPS route plots on this map, which covers an area of roughly 2000 km by 1500 km (3 million sq km). And not a speck of bitumen to be seen. The Gunbarrel Highway was not the first of Len Beadell's tracks, (the first was the eastern end of the Anne Beadell Highway from Mabel Creek to Emu), but it is his most famous and it was the "straightness" of the track building process he used that inspired the name of his "Gunbarrel Road Construction Party". Actually, the Gunbarrel is not straight at all if you look at the map, it meanders around geographic obstacles and between lakes and sanddunes. But it was his method of surveying ahead in his LandRover and then signalling to the graders behind to follow his signs in a straight line which gave this construction method its name. 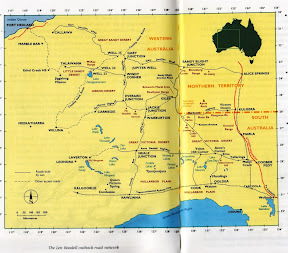 Criss-crossing the deserts of South, Central and Western Australia, Len Beadell built a series of tracks stretching west from Coober Pedy to Laverton (the Anne Beadell Highway), from Kulgera to Willuna (the Gunbarrel Highway) and from Alice Springs to Talawana (the Gary Junction Road). 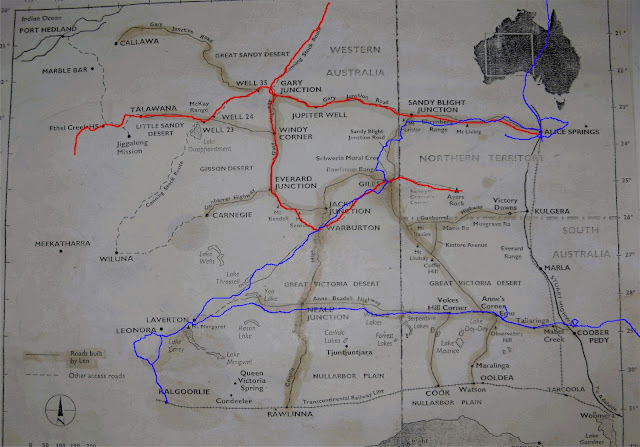 He also built corresponding tracks north from Cocklebiddy to Warburton (the Connie Sue Highway), and then on to Sandy Blight Junction, from the Trans-Australian Railway through Maralinga to Emu, and northwest to 80 Mile Beach (the Gary Highway and Callawa Tracks). only discovered in 1975 and confirmed as an impact crater in 1984. Original 1975 hand written notes are still there in the visitors book. Once we started to learn a bit about the man and his achievements, we got drawn into knowing more about his tracks and how he built them, and a yearning to follow his grader tracks to see what remote desert travel is all about. We have read most of his books, studied his activities and heard tapes of his talks. He was a very independent, self-sufficient person and a very funny writer with a sharp wit and laid back style. This must have made him a joy to have at dinner parties but a bugger to work with. During the 60's and 70's, Len Beadell became good friends with American experts in meteorite craters, Eugene and Carolyn Shoemaker. On visits to Australia they had been researching the Veevers and Connolly Basin craters, access to which had been made possible by the newly formed Gary Highway and Talawana Tracks. They even named an asteroid after him, 3161 Beadell (1980 TB5), 12.5 km diameter. Tragically, Eugene Shoemaker was killed in a car crash on the Tamami Track in 1997 and his ashes were buried on the moon, the only person to date who has been accorded that privilege. Everard Junction at the end of the Gary Highway on the Gunbarrel Highway. Sadly, although we never talked with Len Beadell himself, we did meet him once in his later life at our sons' school speech night in 1995, (as a local dignitary, Beadell House was named after him at Trinity Collage, Gawler). He was too unwell to speak himself so his wife Anne gave a wonderful account of life with Len and their time on the road, on the few occasions he allowed his family to come along. More recently we were even sadder to read of the untimely death of his wife Anne, on 24th November 2010, aged 69. They were married in 1961 and had what must have been a whirlwind 34 year relationship until Len's death in 1995. Anyone who has travelled an outback track in searing heat (and not necessarily in summer time either) can relate to the sentiments in these short extracts of a poem by Barcroft Boake, written around 1890. He might have been describing the conditions Len Beadell would face during the construction of his as yet unbuilt tracks. That's where dead men lie! This poem sends a forceful and realistic message about Australia's harsh outback that's still valid today. It can be read in full here. I have to say that in our air-conditioned and insect-proof 4WD motorhome, with all the comforts of home and the safety features of modern navigation and communications systems, it's difficult not to admire what Len Beadell achieved, all alone for months at a time with a very rudimentary equipment and transport, in a very harsh and then unknown (to Europeans) country. It's just as harsh and almost as unknown now, 50 years later, and his tracks are just as long and remote as they ever were. McDougall Knoll on the Gary Highway. In the past 6 years we have travelled many of Len Beadell's tracks, some quite deliberately, and some just to get from A to B. The first pretty obvious observation is that they are all very long and very remote, so a lot of advance planning is essential. It can be an adventure in itself just to get to the start of most of his tracks. The second thing we discovered is that, with a couple of exceptions, all Len Beadell's tracks are sandy or gravel single lane tracks requiring a high clearance 4WD since they have almost never been maintained in the 50 years since they were built. Most are narrow and corrugated with frequent wash-aways and occasionally overgrown. Len Beadell never built them for casual tourists (they were scientific roads after all) and they are therefore not suitable for caravans or low clearance vehicles. Even his own vehicles suffered many breakdowns and failures, and one even caught fire; his ration truck was destroyed near Kiwikurra while building the Gary Junction Road in November 1960. Anne Beadell Highway, long and straight, but rough. The third thing to be aware of is that, for the most part, there are no buildings, habitation or facilities of any kind along most of Len Beadell's tracks and travellers should be totally self-sufficient in terms of fuel, food, water and vehicle support. An HF radio or satellite phone should also be carried for emergencies. Possible exceptions to this are are the Gary Junction Road, sometimes used as a shortcut from Alice Springs to Marble Bar, and the West Australian section of the Great Central Road from Yalara to Laverton. Both these roads have been redeveloped and are regularly maintained and can be used by sturdy 2WD vehicles, but they are still long and remote gravel roads with widely spaced facilities and the need for considerable advanced planning still applies. Strictly speaking the Great Central Road is not a Len Beadell road, but it does follow the general line of some of his tracks and certainly crosses the same geographic area. Neither is the Canning Stock Route a Len Beadell track since it already existed before Len Beadell built his roads, but it does integrate into his overall road network and is a similar type of track. Some original Len Beadell tracks are no longer accessible, either due to deterioration (eg the abandoned eastern section of the Gunbarrel Highway) or have been absorbed by Native Title restrictions (the Callawa and Mt Davies Tracks). Native Title restrictions are also having an adverse impact of many other tracks as well and obtaining permits may prove difficult, see this report. Our own experiences with a big strong 4WD on Len Beadell's tracks includes broken springs, broken drive shafts and various broken bolts, not to mention body damage from trees and bushes overgrowing the tracks, which can also break off wing mirrors, side lights, aerials and any other protuberances. Punctures however have been relatively few since his tracks across predominately sandy or gravel deserts, but staking of tyre walls on tree roots or fallen branches just off the sides of tracks is always a serious risk, especially with low tyre pressures, so 2 spare wheels, a repair kit and keeping to established wheel tracks is a good thing. Trailers are certainly NOT recommended on Len Beadell tracks either unless they are of very strong off-road construction and even then passing other vehicles is made more difficult, with one or both vehicles having to clamber up the side of the track to create passing space. We have seen many broken and abandoned trailers during our travels and rough outback tracks are just no place for them. Despite the technical risks and distance from help, there is a strong sense of exhilaration and achievement just to travel on such remote and scenic tracks, built 50 years ago, which very few people will ever experience. And they are remote, on the Gary and Gunbarrel Highways, for 5 days and 800 km from Kunawaritji to Warburton, we saw not a single vehicle or person. Our HF radio provided our only contact with the world. McPhersons Pillar 30 km east of the Gary Highway. We have travelled many of Len Beadell's tracks for which we have compiled blog articles describing our experiences. Don't forget to add distances to and from these tracks to the nearest facilities. Gary Junction Road, Alice Springs to Kunawaritji (Well 33 on the CSR). Easy going but long, 1200 km. Several Aboriginal communities selling supplies and fuel. Talawana Track from Well 22 on the CSR/Georgia Bore to Newman via the Rudall River National Park (reference in here). Fairly easy going (rough in RR NP) but remote and lonely, and further than it looks, 500+ km inc. Rudall River visit, (800 km from Well 33), with no facilities. Anne Beadell Highway, from Coober Pedy to Laverton (see also here). Very long, 1500 km, narrow and very corrugated. Only one fuel stop, at Ilkurlka, 750 km west of Coober Pedy. No water on SA section, rain dependent tanks on WA section. Sandy Blight Junction Road, from Giles to Sandy Blight Junction. Tortuous, rough, narrow but one of his more interesting tracks, 400 km. No facilities. Gary Highway, Kunawaritji to Everard Junction on the Gunbarrel Highway. Straight, corrugated but with interesting side trips, 400 km. No facilities. Gunbarrel Highway, east from Everard Junction to Warburton (reference in here), 400 km. Mostly straight, long and corrugated. The Gary and Gunbarrel Highways together total 800 km with no facilities. Canning Stock Route, top section only from Halls Creek to Well 22 via Kunawaritji (Well 33) (references in here and here and here). Very long, 1000 km (700 km to K, plus 300 km to Well 22) and remote from help, with many steep and difficult soft sand dunes, but a great drive. Talawana Track from the Eagle Highway junction to Well 24 on the CSR (200km, reference included in this article). This section of the Talawana track is fairly easy, straight and mildly corrugated for the most part. A good water source is Midway Well, a recently renovated windmill and tank fitted with a new hand pump and excellent quality water. It's about 6km south of the Talawana Track, marked by an oil drum (which we marked with directions). Connie Sue Highway from Neale Junction to Rawlinna/Cocklebiddy (500km and very confusing tracks around Rawlinna and locating a track south). No facilities and Rawlinna is now deserted. Gunbarrel Highway from Geraldton Bore to Willuna. (600km, reasonably corrugated but easily navigable). Supplies and camping at Carnegie Station. Note: the CSR is not a Len Beadell track but it could have been, except that Alfred Canning had already surveyed the track in 1906 and completed its development by 1910. The compelling story of the Canning Stock Route deserves to be the subject of a separate article but it has a link with Len Beadell, since as part of his development of the Talawana Track, he re-discovered several of the wells on the CSR that had been lost by the ravages of time. Our recent treks which include Len Beadell's outback roads. Roll mouse over the photo and click on tracks to visit articles in a new tab. We plan to tackle these Len Beadell tracks in the future (see update below). Since compiling these notes, we have now achieved most of the above planned tracks. We completed the Neale Junction to Rawlinna/Cocklebiddy section of the Connie Sue Highway in 2013. We completed the Gunbarrel Highway from Geraldton Bore to Willuna (and continued out all the way to Steep Point) also in 2013. We did the Talawana Track from the Eagle Highway junction to Well 24 on the CSR in 2012. We did the whole Kidson Track from Kunawaritji (Well 33 on the CSR) to 80 Mile Beach in 2012. In The Wheel Tracks of Len Beadell, 2 articles by Laurel and Gordon Rollinson in the Oka Owners Group News letters of April and August 2003, which can be seen here. Len Beadell website here, where his books can be bought. They are also available at ABC Shops and Westprint.